For so long, Israel’s Prime Minister has warned Iran about crossing the ‘red line’ – an ultimatum which has characterised most of Netanyahu’s tenure as PM. His warnings were issued to Iran with a tone of profound confidence and proclaimed at the highest levels of government. His speeches were arresting and the news organisations around the world cashed in on the sensationalism of it all. Many would remember his vivid speech to the world at the United Nations where despite irreconcilable world views, world leaders gather to epitomise unity and peace on earth while on the other hand, Netanyahu presented an explosive chart showing the sketch of a bomb with – you guessed it – a red line. However, in the last few years, the red-line rhetoric fizzled out when under President Obama, the US put Netanyahu into a headlock and used the other arm to give Iran a load of cash as part of the Iran deal. While to the North, Russia’s grand move into Syria left an irritating little scribble on Netanyahu’s red-line. As times have changed, the reality is that a bigger problem looms on the horizon: another red-line – this time, not Netanhayu’s. Until now, Netanyahu’s military exploits in Southern Syria have been left unchecked by the Russian occupying force – most likely against the will of the regional Russian military commanders. Netanyahu has bombed Syrian tanks that have strayed towards the Israeli border and even bombed Hezbollah targets close to Damascus while Putin seems to have had more interest in Sochi’s weather. Yet, only a few days ago, a senior Israeli official outright threatened to bomb Damascus – still, no response from Putin. But when it came time for Putin’s turn to talk, the conversation did not go so well; “Iran is Russia’s strategic ally in the Middle East,” Putin told Netanyahu. Witnesses present during part of the nearly two-and-a-half hour meeting say that following the Prime Minister’s entreaties to the Russian leader, Putin sighed, telling Netanyahu his government would be unable to assist; “Unfortunately, we can not help you here.”. This is Netanyahu’s fourth trip to Russia in the last 16 months, and his sixth meeting with Putin during this same time frame. Netanyau said that the reason he wanted to hold talks now with the Russian leader was because the situation inside Syria has changed very rapidly over the last few weeks. Less than a week after Netanyahu warned Putin, Putin put Netanyau’s warning to the test. DEBKAfile reports exclusively from its military and intelligence sources that on Saturday and Sunday Aug 26 – 27, Russian forces installed Iranian Revolutionary Guards and Hizballah officers at a joint “administration center” they had set up in the town of Quneitra – 5 Kms from the Israeli border. Surveillance spotters saw them moving 2 km from the Golan border, the closest hostile Iranian and Hizballah troops have ever come to Israel’s border with Syria. The reality is that while Israeli enemies gather on its border with Putin’s explicit support, Netanyahu’s tattered red line could well soon be replaced with Putin’s very literal and meaningful red line – Israel could lose its authority overnight to strike freely in Southern Syria. What then of Israel’s red line? This article has been published by Debka here. The Russian engineering corps has started building a new base in southeastern Syria at a small village called Khirbet Ras Al-Wa’r in the Bir al-Qasab district. Until now, Moscow adhered to a policy of restricting its military presence to the western part of the country along the Mediterranean coast; no Russian troops were based further east than Palmyra. The new facility is the first to be established since Moscow’s initial military intervention in the Syrian war in September, 2015. DEBKAfile’s military sources say it will provide Russia with a lever of control over the volatile Syrian southeast and its borders, where US-backed and Iranian-backed forces are fighting for dominance. Russian forces will also stand closer than ever before to the Israeli border – 85 kilometers from central Golan and 110 kilometers from southern Golan, not far from IDF military positions. 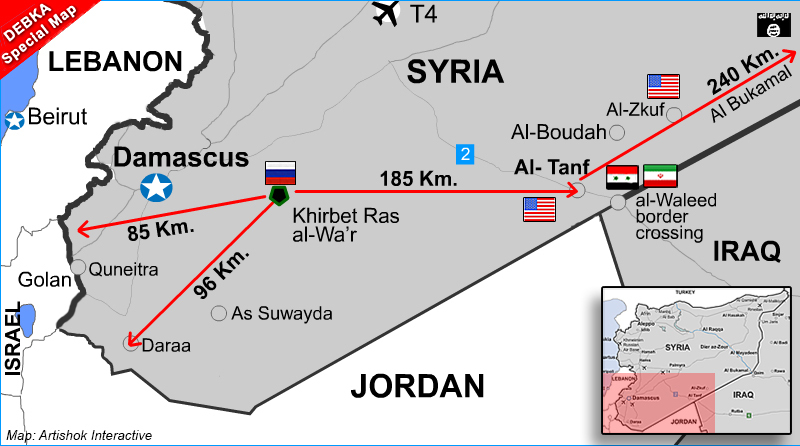 The new Russian foothold will be located strategically 96 kilometers from northern Jordan and 185 kilometers from the American and Jordanian special forces garrison at the al-Tanf crossing inside the Syrian, Jordanian and Iraqi border triangle. Placing the new base just 50 kilometers from Damascus serves another primary function, that of securing the strategic crossroads leading from eastern and southern Syria to the capital – in other words, propping up the regime of Syrian President Bashar Assad. Our intelligence sources note that construction on the new Russian base began concurrently with the resumption his week of secret US-Russian talks in the Jordanian capital, Amman. They are led by Michael Ratney, the special US envoy for Syrian affairs and Aleksandr Lavrentiev, for Moscow. American forces will continue to hold the al-Tanf crossing. In return, they will agree to Iranian, Syrian and Hizballah forces capturing from ISIS – and holding – the border town of Abu Kamal, further to the north. Moscow will guarantee the withdrawal of Iranian troops, pro-Iranian militias and Hizballah forces from southeastern Syria region at some point in the process. A joint US-Russian administration will be established to conduct the day-to-day affairs of southeastern Syria, including the areas along the Israeli and Jordanian borders. Washington has so far turned Moscow down on this plan for two reasons: First, the Syrian army’s conquest of Abu Kamal would strengthen Iran’s grip on the Syria-Iraq border area, the prevention of which is a primary US objective. And second, the Americans want Iranian and Hizballah forces out of the region before any other steps are taken – instead of later, as per the Russian guarantee. This, the Russian negotiators were not prepared to concede. Over the course of the last two years, many events have happened which signal that we are living in the last days. We are witnessing an emergence of a strong alliance between Saudi Arabia, the Gulf States and Britain, as well as a resurrection of her Commonwealth – who under Britain will become more closely aligned and ultimately opposed to Europe and the Russian confederacy. Ever since the recent elections in the UK and USA, Theresa May and Donald Trump have been very active rebuilding alliances described in Ezekiel’s chapter. Previously under the Obama Administration, the US sought to kindle a friendship with their enemy Iran, to the detriment of their allies – Israel, Saudi Arabia and the Gulf States. This was seen through the Iran nuclear deal which Saudi Arabia and Israel saw as a security threat. This deal dramatically damaged the US-Saudi relationship, as Saudi Arabia and Iran are rival powers (because they are opposing Muslim factions – Saudi Arabia is Sunni, and Iran Shiite). The US appears to part of the ‘young lions’ due to their long relationship with Britain. Although they are not part of the Commonwealth, they are a daughter of Britain, and have consistently been an ally of Britain. Consequently as a young lion, the US’ growing friendship with Saudi Arabia, is scripturally significant. President Trump has said he will reverse many of Obama’s policies, and this has become particularly obvious in his effort to strengthen alliances with Israel, Britain (rather than Europe), the Commonwealth nations and the Gulf States. This change in American foreign policy has also been demonstrated by US Secretary of Defence James Mattis’ recent visit to Saudi Arabia to discuss counter-terrorism (the Yemen Civil War), and increasing military and economic ties. 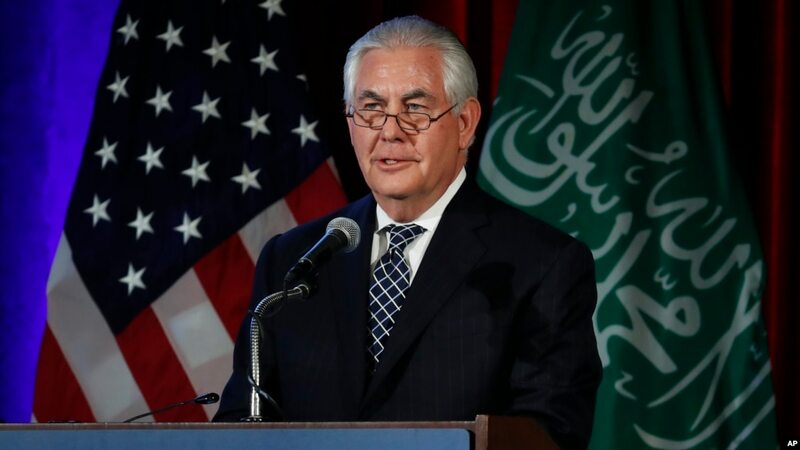 Also Secretary of State Rex Tillerson spoke at a recent US-Saudi business summit, which encouraged increased business ties between the two nations. Despite not gaining much media attention, the Yemen civil war has dramatically impacted the Middle East – creating 2.5 million internally displaced people, hundreds of thousands of refugees and has triggered increased Western involvement in the region. The Yemen civil war is a key part of the recent resurgence of a stronger Sheba (Gulf States) and Dedan (Saudi Arabia) alliance, which has also served to strengthen British and Americans support of the Gulf States. The civil war began in 2015. The war is a dispute between the internationally recognised Sunni government led by President Hadi and the Shia rebel group, Houthi. The Sunni government are backed by Saudi Arabia, and the Shia rebels, Iran. Hence the Yemen civil war is a proxy war between Iran and Saudi Arabia. Like Syria, there are several faction groups fighting (Hadi government, ISIS, Al-Qaeda and Houthis), but in its simplest form the Yemeni civil war is a war of religion. Yemen is 56% Sunni, and 44% Shia. Saudi Arabia (Sunni) is fighting in Yemen, to keep Iran (Shia) out of Yemen, to avoid having them as a threatening neighbour. Previously as Obama wanted to side with Iran, the US had condemned Saudi Arabia’s participation in the war. However now with a change in administration and foreign policy, President Trump has authorised increased airstrikes in Yemen to support the Saudis and has recently even offered to give Saudi Arabia military and intelligence support. As Yemen is part of the Biblical territory of Sheba, Trump’s recent involvement in Yemen and support of Saudi Arabia, is bringing together the alliance of Ezekiel 38 that we expect. India is part of the British Commonwealth, and has recently developed closer ties with Britain and Israel. In 1947, India gained independence from the British. However due to the internal conflict between the Hindu and Muslim population, the nation soon split into India and Pakistan. These two nations have continued to have a contentious relationship. As Pakistan has become increasing isolated (and wanting to push away from Western influence), they have turned to Russia for military and security support. Likewise, India has begun developing a closer alliance with Israel and now post Brexit, with Britain. The religious divide between these nations, has forced them both to develop alliances in accord with Bible prophecy (Pakistan being an extension of the King of the North territory (Daniel 11), and India a young lion, therefore a supporter of Israel). In November 2016, Theresa May visited India to discuss a potential trade deal, as the triggering of Article 50 loomed. Previously under the EU, Britain was not allowed to create a free trade agreement with India. Brexit has not only facilitated Britain to leave Catholic Europe, but also pushed them to strengthen their relationship with their “young lions” (the Commonwealth). Although a free trade agreement with India has not yet been constructed, it appears to be only a matter of time. Similarly India has also begun to develop business ties with the other allies of Israel – Saudi Arabia and the Gulf States. Over the past few years India and Israel have also been developing a closer relationship. India has abstained from voting against Israel in several UN resolutions. In 2015 India and Israel negotiated several extensive trade deals. In November 2016 the Israeli President visited India. In July this year, Prime Minister Modi will visit Israel (the first Indian PM to visit Israel). Previously Indian Ministers have visited both Israel and Palestine to indicate their neutrality. However this time, Modi is only visiting Israel – showing their clear support of Israel. As the Brexit process has officially begun, Theresa May is seeking to develop trade deals with non-EU nations (as seen by recent discussion about potential trade deals with Australia, US, New Zealand, Canada and India). Consequently she has turned to her Commonwealth and the Sunni Arab nations to create trade deals, to prepare Britain’s economy for life post-Brexit. In December, Theresa May flew to Bahrain to meet with the GCC (Gulf Cooperation Council: which includes Saudi Arabia, Yemen, Oman, UAE, Bahrain, Qatar and Kuwait) to develop trade agreements. This month, May has also flown to Saudi Arabia, and met with King Salman, the Crown Prince and other Saudi officials to discuss trade and investments. Also this month, the Qatar PM flew to meet with Theresa May in London to create a post-Brexit trade deal. Likewise also the UK Secretary of State for International Trade has recently said the UK wants to increase trade with Oman by a billion pounds. Brexit has not only pushed the UK out of Catholic Europe, but also has forced it to create alliances and trade deals with Sheba and Dedan – preparing the alliances for Armageddon. While many prophetic events have been occurring in Russia, Syria and Europe, the defenders of Israel have begun to emerge. Tarshish, Sheba, Dedan and the ‘young lions’ have begun to form not only by the creation of alliances with each other, but also their increasing isolation that has driven them to befriend and support Israel. Their unification could drive a wedge between them and the European-Russian confederacy – as Ezekiel 38 foretells. Russian forces in Syria have fired at least twice on Israeli military aircraft, prompting Prime Minister Benjamin Netanyahu to seek improved operational coordination with Moscow, Israel’s top-selling newspaper said on Friday. The unsourced report in Yedioth Ahronoth gave no dates or locations for the incidents nor any indication Israeli planes were hit. Russia mounted its military intervention in Syria in September to shore Damascus up amid a now 5-year-old rebellion. Separately, Israel’s Channel 10 TV said a Russian warplane approached an Israeli warplane off the Mediterranean coast of Syria last week but that there was no contact between them. An Israeli military spokesman declined comment. Netanyahu’s office and the Russian embassy in Israel did not immediately respond. srael, which has repeatedly bombed Syria to foil suspected arms handovers to Lebanese Hezbollah guerrillas, was quick to set up an operational hotline with Moscow designed to avoid accidentally trading fire with Russian interventionary forces. According to Yedioth, the reported Russian fire on Israeli planes was first raised with Putin by Israeli President Reuven Rivlin, who visited Moscow on March 15. At the time, Putin responded that he was unaware of the incidents, Yedioth said. “Be ready and keep ready, you and all your hosts that are assembled about you, and be a guard for them. 8 After many days you will be mustered. In the latter years you will go against the land that is restored from war, the land whose people were gathered from many peoples upon the mountains of Israel, which had been a continual waste. Its people were brought out from the peoples and now dwell securely, all of them.